Since it seems to be the cool thing to list a bunch of foods that taste testers deem amazing and dietitians deem nutritional (ahem Self Magazine), I thought I would have a shot at it. DISCLAIMER: I am a panel of myself and I am not a dietitian, however I do eat all of these things on a semi-regular basis and maintain good health. Choose whether or not to listen to my advice at your own risk. I repeat, I have no educational degree(s) in the area of dietetics! BEWARE! I don’t know what I’m talking about! Lean, grass-finished ground beef…preferably stir fried with beans and served steaming. There may not be any better comfort food than this. A whole local, pastured chicken stuffed with an organic lemon, painted with organic olive oil and popped into the oven for a time. Feast with friends and it’s actually cheap when you split the cost! Ethical and delicious. The heirloom tomato! And it may fit into all of the other categories below, as well. I used to be a farm worker and tend to these things and they are the queens of the land, baby. Big, juicy moneymakers that are always the star of the show no matter how you make them or serve them. Once I knew a lady that ate eight of them a day like apples. Awesome. Carrots. Great roasted, stewed, and fresh. Gotta go organic. I love the ones straight out of the ground with the stems still on. Pretty! A non-Netherlands local pepper has got to win here for me! Gotta be local, gotta be organic or equivalent. Cut these babies up and put them over a salad and BAM instant color and improvement. Spinach. I am the reincarnation of Popeye if Popeye identified as female and ate mostly local and organic foods. Also if he had smaller biceps. Sugar. Snap. Peas. If you’re tried them, you would understand why I wrote it like that. Le eggplant. Sautee this baby in some olive oil or put it in some deliciously high-fat coconut milk and turn it into curry. I love curry. The apple, hands down. Especially where I live. I can get them local and pesticide free year-round from a farmer at the market. So good, so many different varieties! 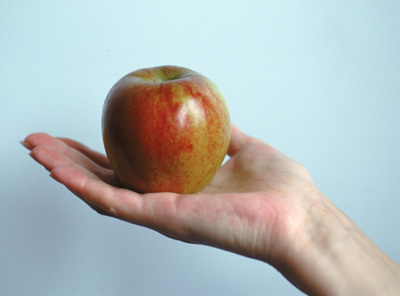 How could you ever settle for one of those null, mealy-tasting, wax-covered creepily shiny apples at the grocery store? No thank you I prefer the good stuff. Plus, how cool is the story of Johnny Appleseed? Oranges are nice but I don’t eat them much. They are most definitely, like a banana, a treat for the part of the country I live in. The banana: I like it best dipped in tahini. Green apples. Not as much my taste, but anything that’s an apple is my friend forever. Sometimes there is no greater summer joy than the first blueberries of the season. I love plums. I haven’t had one for a long time but I love them. They have a nice skin I enjoy devouring. These things are to be enjoyed in moderation. What is life without a little fun? Read: little. Gets its own category, but of course. This winner is dark, fair trade, and organic: the trifecta of chocolate WIN. A thick slice of honey wheat bread from my local bakery (made from organic flour) slathered in butter with more honey drizzled on top from my dad’s beekeeping days. Perfection. Try also in the form of French Toast. Wow. Sweet potatoes. Preferably in roasted or deep fried form. Cheesecake. Need I say more? Anything and everything on this list or anything else in a package that is labeled “healthy” I usually stay away from. Come to think of it, anything in a package fits in this category. Definitely not pre-cut fruits or veggies. I am not that lazy and am too cheap to want to pay that much more for a silly labor premium. I can actually cut them myself. That’s enough reason for me! This entry was posted in Best of, Worst of and tagged apples, bananas, blueberries, carrots, cheesecake, chicken, chocolate, dieticians, eggplant, grass-fed beef, heirloom tomato, Johnny Appleseed, peppers, spinach, sugar snap peas, sweet potatoes, tahini. Bookmark the permalink.